Rabbits are very good at looking after themselves generally. They can behave like they are very independent and hardy animals but beneath the bushy hair they are actually quite delicate. Their skin is very delicate and is the reason why they need the coats they have and so they sometimes need a helping hand to help groom themselves. They are very clean animals and will look to keep themselves as clean as possible using their tongue and paws. Most of the time they will not require any assistance with this. However, there are things that they just cannot do that will require the assistance of diligent and caring owners. By grooming your rabbit and giving them a helping hand with the things that they cannot do, they will really value the time you have spent doing this. They are creatures that take pride in keeping themselves well kept, and so any assistance you can provide in making this happen is appreciated by them. When they start to shed, large amounts of hair will start to come out. When a rabbit is shedding their hair, you can pluck their hair. However, be aware that most rabbits will not like this. But you will have to do this otherwise you won’t be able to get the comb through it sufficiently. When this occurs, the rabbit may just start grooming themselves naturally. 2. They need to be groomed and brushed at least once a week. When they do this, they will naturally ingest hair. There will always be hair lining their stomach, unfortunately, and it slows down their gut. This is unavoidable. However, rabbits will get hairballs build up if they ingest too much. But you can make life a bit easier for them by grooming them. 3. Use particular brushes. To help groom them then use a specialist flea comb or a brush to help comb their hair through. A method to comb their facial and ear hair is to use an eyebrow comb which has fine comb points that will get into the minute places to remove sand particles and such like from their hair. 4. Grooming the top of the tail is an important task as it is a hard place for them to reach.When you groom them here, you will usually get a good amount of hair out. When they get older and more obese, this will especially be the case. 6. Fleas can be an issue with rabbits. Use a flea comb or get some good advice from your veterinarian. 7. Beware of bathing your rabbit. They are very stressful experiences for them. They bathe themselves and look to keep themselves very clean. You will not usually have to bathe your rabbit in water. Only in exceptional circumstances should this be done. 10. Get advice from a veterinarian on any skin disorders. 11. To clean the scent glands or to not clean the scent glands? Some owners clean the rabbit’s scent glands. They are very hard to see but are on either side of the genital area. They will be a waxy substance and will have a coffee-like scent. Just make sure that there is nothing obstructing the scent glands and make sure your rabbit can clean them without an issue. 12. Trim nails in exceptional circumstances. 14. Don’t let them have sore feet. 15. Take extra care with a rabbit with incontinence. 16. Take extra care with a rabbit with incontinence. 18. Make sure their teeth are in shape. If you have a rabbit you may see them up and about in the dark at night time. This may seem quite strange especially if they don’t have any light to draw upon to see where they are going. This begs the question, can rabbits see in the dark at all? Well the thing is that rabbits can see very well in the dark. They don’t have the same problems with it that we do. Their eyes adjust well to the darkness and as prey animals they are built to be able to move around at night and evade their predators. They also use their keen sense of smell to make their way around at night and this helps them to sense where they are going and what’s around them. What do I need to groom my rabbit? What do I need to groom my rabbit? f you have a rabbit that sheds their hair, this is a pretty important task. Most rabbits will tend to shed their hair about three times a year.Some rabbits may seem to do this continuously. Some rabbits have patterns of shedding. When this happens, the rabbit is naturally going to start grooming themselves. When they do this, they will naturally injest hair. There will always be hair lining their stomach, unfortunately. This is unavoidable. But you can make life a bit easier for them by grooming them. Make sure you brush your rabbit at least once a week. If you want to do a good job, there are three types of brushes you can get; A Pin Brush, a bristle brush and a mat rake. For brushing basic a rabbit hair, get a pin brush. For removing tangles which are too big, use the mat rake. Make sure you brush your bunny more when they are shedding their fur. They shed their fur every three months and mostly during spring and fall. This is a symptom that many rabbit owners have testified to have seen in their rabbits. It can be a worrying thing when you suddenly feel that your rabbit’s normally warm ears have suddenly become cold. It is important to understand that rabbits regulate their temperature through their ears. When a rabbit has stomach pain they often feel cold to the touch. If they are not eating, is quiet and cold you need to call your veterinary surgeon who will be able to give further advice on the situation. Rabbits are some of the most popular pets in the world today. They are well beloved of many owners who treasure them for their passive nature, their amenability and general cuteness. When thinking about getting a rabbit, many future owners often reflect on the question of whether they should get one rabbit or two. So can rabbits live alone? Rabbits can live alone but is not their most favored way of living. They much prefer living with another friendly rabbit and keeping one together with another bunny is the advised way of keeping them. Unless of course you are otherwise advised by a veterinary surgeon or a qualified animal behaviorist. 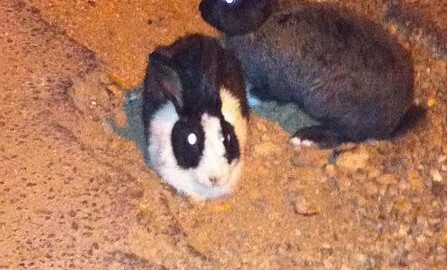 Rabbits are social animals and prefer the company of other rabbits. They form a pecking order with one becoming more dominant than the other. Some animals become more dominant that others, and is a perfectly normal situation. If they are left alone, rabbits can unfortunately develop behavior that is not normal for them. Rabbits that are left with nothing to do and with no company for long periods can suffer as a result. It can be bad for their well being. If your rabbit has to be kept alone, make sure that they have regular companionship. A good combination to keep is a neutered male and a neutered female. When they are neutered, it reduces the risk that they will fight. Bring them inside as indoor rabbits. This way they can feel part of your family and benefit from the interaction they will have with your family. Believe it or not, they will gain a lot from spending time with your family and the conversation that occurs within the household. Make sure that you provide things for them to do to ensure that they are not bored during down time when there is no one in the house. If you want to introduce a rabbit to your pet so that they don’t get bored then this is an admirable thing to do. When introducing new rabbits to each other, this needs to be done gradually and under supervision. This also needs to be done in a space which is unfamiliar to both rabbits. Rabbits that are introduced together as adults may fight to start with. So have two separate places for them and gradually introduce them together in supervised times. Have set periods of time for them to spend with each other and get ready to pull them out if things start to get tetchy in there. Rabbits get red eye when there is the appearance of blood vessels in the eyeball. This causes a swelling or irritation in the eyelid of the rabbit. If you find that your rabbit has red eye then they need veterinary assistance immediately. It is usually a symptom of something more serious. A rabbit friendly veterinarian will run an analysis to discover the core issue affecting your bunny. They can then prescribe a course of action to help them recover.